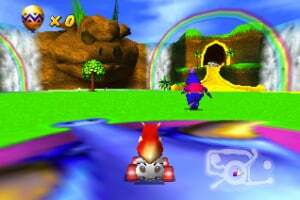 It's an island takeover when the evil space wizard, Wizpig, discovers Tiger Island! 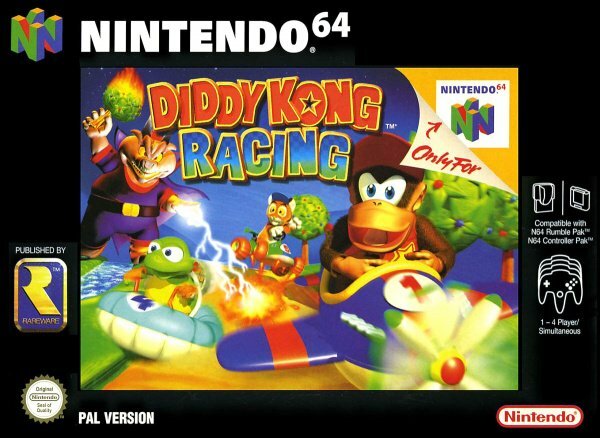 After the islands prized racetracks become sealed up, Timber Tiger contacts his friend Diddy Kong to help him reclaim the racetracks and save the island before his parents return. 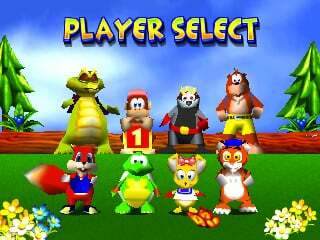 Along for the ride are the Kremling spy Krunch, Bumper Badger, Banjo (prior to meeting Kazooie in Banjo-Kazooie), pre-sweary Conker, Tiptup Turtle, and Pipsy Mouse. 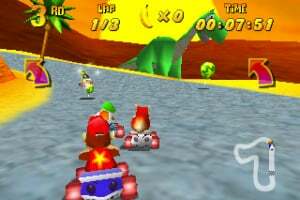 Diddy Kong Racing is a racing game with similarities to Mario Kart 64, in that you race with a variety of cheery racers while using weapons. However, the similarities end there. 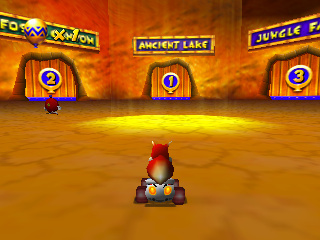 DKR includes an adventure mode, which features bosses, an overworld to explore, many hidden secrets, the addition of hovercrafts and planes, and a unique way of racing called the "Silver Coin Challenge". 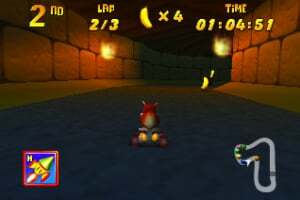 In this mode, in addition to coming first, you must also find the eight Silver Coins deviously hidden throughout the courses (some in alternate paths). 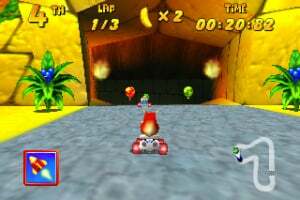 The game also features a strategic method of using weapons. 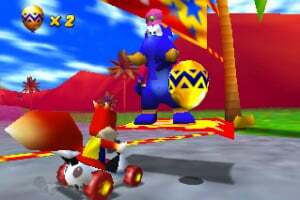 Each colored balloon on the track matches a specific weapon, and collecting the same type of balloon multiple times in a row powers it up (to a maximum of three times). 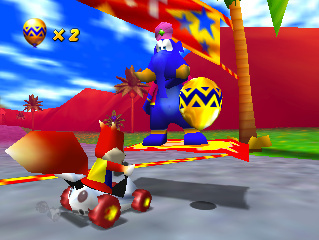 This gives the player the choice of snatching every balloon available and using it immediately, or storing the existing weapon, and using a more powerful version of it later. 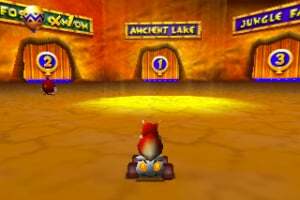 Up to four players can compete in the races, but in order to play new tracks, they must first be unlocked in the single player game. 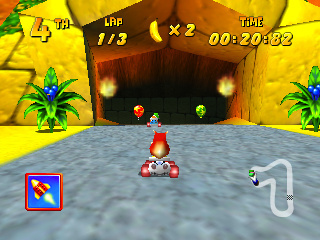 There are also four battle modes of play - two standard deathmatch maps, a capture-the-flag style battle where you must nab eggs and hatch three of them in your home nest, and another where you must be the first to return ten bananas to your treasure chest (with the limitation of only being able to hold two at any one time). 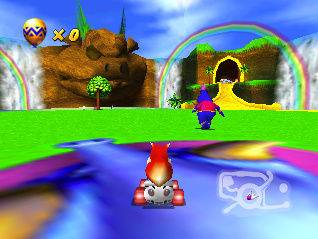 I really enjoyed playing this game when I was younger - it was one of the first games I got with my N64. 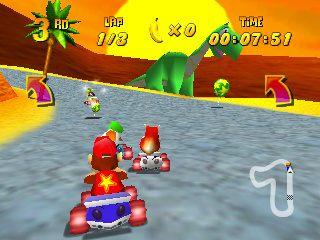 Still haven't made my mind up about the DS version, though. 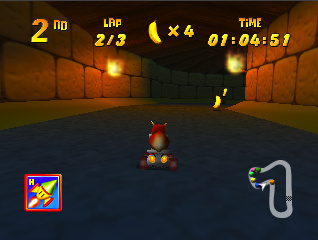 I loved the original, although it was quite the challenge. The DS version got crap reviews though, so i'm hesitant to get it. 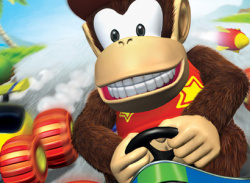 Guys, I have the original and rented the DS game. They r both really fun! 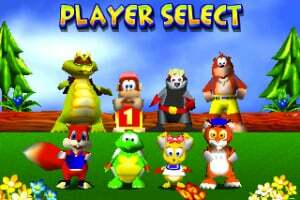 We must have a come back for this game on virtual console, buy the right for characters use! 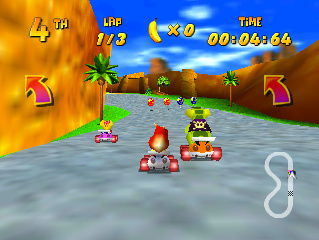 Must see a NEW DIDDY KONG RACING SEQUEL TOO! 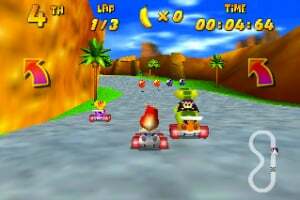 Rumour Was Monster Games Working On A Sequel To Diddy Kong Racing?